DAHIYA, P. , SHARMA, V. , NARESH, R.
This paper presents the application of hybrid opposition based disruption operator in gravitational search algorithm (DOGSA) to solve automatic generation control (AGC) problem of four area hydro-thermal-gas interconnected power system. The proposed DOGSA approach combines the advantages of opposition based learning which enhances the speed of convergence and disruption operator which has the ability to further explore and exploit the search space of standard gravitational search algorithm (GSA). The addition of these two concepts to GSA increases its flexibility for solving the complex optimization problems. 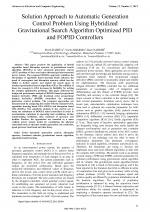 This paper addresses the design and performance analysis of DOGSA based proportional integral derivative (PID) and fractional order proportional integral derivative (FOPID) controllers for automatic generation control problem. The proposed approaches are demonstrated by comparing the results with the standard GSA, opposition learning based GSA (OGSA) and disruption based GSA (DGSA). The sensitivity analysis is also carried out to study the robustness of DOGSA tuned controllers in order to accommodate variations in operating load conditions, tie-line synchronizing coefficient, time constants of governor and turbine. Further, the approaches are extended to a more realistic power system model by considering the physical constraints such as thermal turbine generation rate constraint, speed governor dead band and time delay. H. Saadat, Power system analysis, 2nd ed. New Delhi, India: TMH, pp. 551, 2002. Ibraheem, P. Kumar, D.P. Kothari, "Recent philosophies of automatic generation control strategies in power systems," IEEE T Power Syst, Vol. 20, No. 1, pp. 346-57, Feb. 2005. H. Shayeghi, H.A. Shayanfar, A. Jalili, "Load frequency control strategies: A state-of-the-art survey for the researcher," Energ Convers Manage, Vol. 50, No. 2, pp. 344-353, Feb. 2009. S.K. Pandey, R.M. Soumya, N. Kishor, "A literature survey on load-frequency control for conventional and distribution generation power systems," Renew Sust Energ Rev, Vol. 25, pp. 318-334, Sep. 2013. S.J.P.S. Mariano, J.A.N. Pombo, M.R.A. Calado, L.A.F.M. Ferreira, "A procedure to specify the weighting matrices for an optimal load-frequency controller," Turk J Electr Eng Co, Vol. 20, No. 3, pp. 367-379, 2012. N. Hasan, Ibraheem, P. Kumar, N. Nizamuddin, "Sub-optimal automatic generation control of interconnected power system using constrained feedback control strategy," Int J Elec Power, Vol. 43, No. 1, pp. 295-303, Dec. 2012. A. Demiroren, N.S. Sengor, H.L. Zeynelgil, "Automatic generation control by using ANN technique," Electr Pow Compo Sys, Vol. 29, No. 10, pp. 883-896, 2001. A. Zavoianu, G. Bramerdorfer, E. Lughofer, S. Siber, W. Amrhein, E.P. Klement, "Hybridization of multi-objective evolutionary algorithms and artificial neural networks for optimizing the performance of electrical drives," Eng Appl Artif Intel, Vol. 26, No. 8, pp. 1781-1794, Jun. 2013. E. Cam and I. Kocaarslan, "Load frequency control in two area power systems using fuzzy logic controller," Energ Convers Manage, Vol. 46, No. 2, pp. 233-243, Jan. 2005. M.I. Alomoush, "Load frequency control and automatic generation control using fractional order controllers," Electr Eng, Vol. 91, No. 7, pp. 357-368, Jan. 2010. H. Shayeghi, A. Jalili, H.A. Shayanfar, "Multi-stage fuzzy load frequency control using PSO," Energ Convers Manage, Vol. 49, No. 10, pp. 2570-2580, Oct. 2008. F. Valdez, P. Melin, O. Castillo, "An improved evolutionary method with fuzzy logic for combining particle swarm optimization and genetic algorithms," Appl Soft Comput, Vol. 11, No. 2, pp. 2625-2632, Mar. 2011. N. A. El-Hefnawy, "Solving bi-level problems using modified particle swarm optimization algorithm," Int J Artificial Intelligence, Vol. 12, No. 2, pp. 88-101, Oct. 2014. E.S. Ali, S.M. Abd-Elazim, "Bacteria foraging optimization algorithm based load frequency control for interconnected power system," Int J Elec Power, Vol. 33, No. 3, pp. 633-638, Mar. 2011. U.K. Rout, R.K. Sahu, S. Panda, "Design and analysis of differential evolution algorithm based automatic generation control for interconnected power system," Ain Shams Eng J, Vol. 4, No. 3, pp. 409-421, Sep. 2013. H. Shabani, B. Vahidi, M. Ebrahimpour, "A robust PID controller based on imperialist competitive algorithm for load-frequency control of power systems," ISA T, Vol. 52, No. 1, pp. 88-95, Jan. 2013. S. Debbarma, L.C. Saikia, N. Sinha, "Automatic generation control using two degree of freedom fractional order PID controller," Int J Elec Power, Vol. 58, pp. 120-129, Jun. 2014. E. Rashedi, H. Nezamabadi-pour, J.S. Saryazdi, "GSA: a gravitational search algorithm," Inform Sciences, Vol. 179, No. 13, pp. 2232-2248, Jun. 2009. 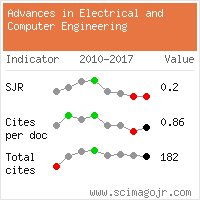 R.K. Sahu, S. Panda, S. Padhan, "Optimal gravitational search algorithm for automatic generation control of interconnected power systems," Ain Shams Eng J, Vol. 5, No. 3, pp. 721-733, Sep. 2014. R. E. Precup, R. C. David, E. M. Petriu, S. Preitl, A. S. Paul, "Gravitational search algorithm-based tuning of fuzzy control systems with a reduced parametric sensitivity," Series: Soft Computing in Industrial Applications, Advances in Intelligent and Soft Computing, Vol. 96, pp. 141-150, 2011. S. Rahnamayan, H.R. Tizhoosh, M.M.A. Salama, "A novel population initialization method for accelerating evolutionary algorithms," Comput Math Appl, Vol. 53, No. 10, pp. 1605-1614, May 2007. B. Shaw, V. Mukherjee, S.P. Ghoshal, "A novel opposition-based gravitational search algorithm for combined economic and emission dispatch problems of power systems," Int J Elec Power, Vol. 35, No. 1, pp. 21-33, Feb. 2012. S. Sarafrazi, H. Nezamabadipour, S. Saryazdi, "Disruption: a new operator in gravitational search algorithm," Sci Iran, Vol. 18, No. 3, pp. 539-548, Jun. 2011. A.W. Berger, F.C. Schweppe, "Real time pricing to assist in load frequency control," IEEE T Power Syst, Vol. 4, No. 3, pp. 920-926, Aug. 1989. I.C. Report, "Dynamic model for steam and hydro turbines in power system studies," IEEE T Power Ap Syst, Vol. PAS-92, No. 6, pp. 1904-1915, Nov. 1973. I.W.G. Report, "Dynamic models for fossil fuelled steam units in power system studies," IEEE T Power Syst, Vol. 6, No. 2, pp. 753-761, May 1991. W.I. Rowen, "Simplified mathematical representation of heavy duty gas turbine," J Eng Gas Turb Power, Vol. 105, No. 4, pp. 865-870, Oct. 1983. Citations for references updated on 2019-04-21 12:59 in 180 seconds.